you might be surprised to find out its time for a change. Are you having cash flow difficulties? If you asked each employee if they were happy with their job, would the response be a resounding yes? Do you client due dates frequently unmet? Is your net profit margin less than 5%? Are clients slow to pay? Does your Sales staff fail to meet quota regularly? Does production perform rework more than once a month? Have you put off your vacation to be at work? Does your spouse complain about the amount of time you spend at work? If you answer YES to three or more we can help, call today! 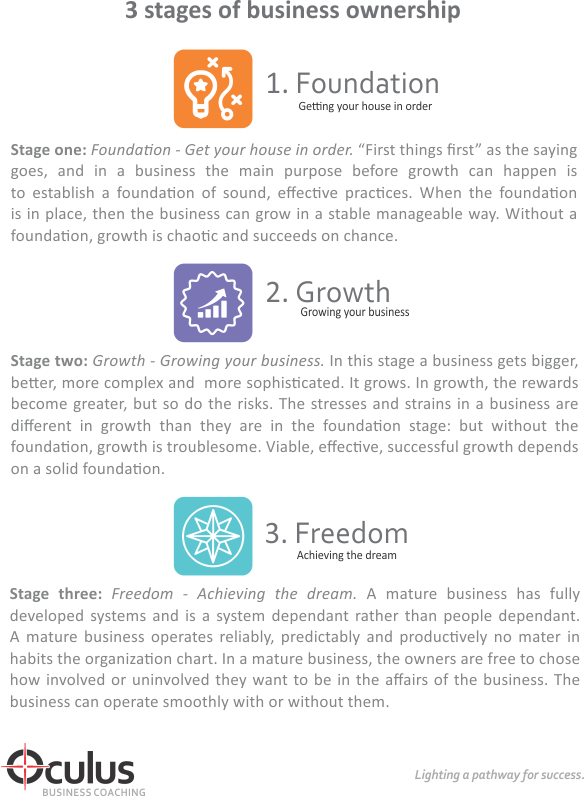 Are you a stage 3 business owner? If not not call Oculus Business Coaching today for a free 30-minute consultation to learn how we can help get you back on track.